The message of a carpenter from Nazareth? 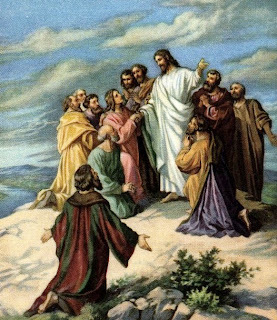 “We had hoped he was the one,” was the disappointing drone of the disciples from Emmaus as they lumbered home and back to the old life they had lived before the One had come. Some might tell the story, but only as a tale of momentary victory over the oppressor. All that seemed so alive had been crucified on that dreaded Roman machine at Golgotha. The End had not yet come. Satan’s time would go on, or so was the rumor of the Jews in Jerusalem. It seems however, that those first disciples had little difficulty understanding that the mission of Jesus did not end with His death. They heard His words, “Go into all the world,” but what had prompted them to continue to go, now thirty-seven years later, even if death was waiting for them there? This is Matthew’s goal in writing his gospel account. So that we would know, both the power of the Gospel’s message in our lives, and the command to take that message to the ends of the world, until the Lord returns. Today, we have embraced the former, yet neglected the latter. And a generation of those for whom Christ died is awaiting an awakening into new birth which must come from our lives and message. We too have a task to accomplish, and it is identical to the one given to those early disciples. Let us go, preach, baptize, and disciple until the end of the world and in confidence that the Savior is with us! John, This is a great message. Ed and I listened to it tonight.... Great! I especially was challenged by the reconciliation message that we are called to bring to this lost world..
John, if you weren't my brother-in-law, I might not be as proud of you as I am. I know your commitment to the Lord and also that you love my sister with a Godly love.. I am also proud of my nieces and nephews.. You and Karen have done a great job with your kids.